Hi everyone I know it has been another few weeks since I’ve written anything but recently at the end of the day I haven’t wanted to take the time to write; just veg. I’m sure you all have those phases or moments. As you know life has been pretty busy through March and April. To start with I just finished teaching a 5 week intensive/accelerated College Writing Course, which to give you some perspective, is like cramming three weeks of of a semester long course into a once a week four hour class. This course is difficult not only because the classes themselves are long (and a night) but also because the turn-around rate for grading and planning is ridiculously fast. But the course if over and now and I’ve already gotten the contract to teach it again in summer. Now I am in the phase of praying my way through final grading decisions. Adding to the busyness we are both involved in the Easter production with our church. In the last two weeks we had practice Monday and Tuesday nights from 6:30-9pm and had Saturday dress rehearsals from 9-4pm. This past weekend was intense since we had practice all day Saturday and then two performances on Sunday at 4 and 6pm. And we aren’t done.Ttonight we will be preforming again at 7pm and then on Good Friday twice at 6 and 7:45pm! I am grateful I am not teaching this week and can finally play catch-up on a few life items that have been put aside while being more social. Now you introverts out there would understand that the heightened amount of socializing we’ve had in the past few months can get a bit exhausting. So taking the time to do hobby items, bake, blog, journal have been pushed aside for quiet time reading and or vegging with my husband when we actually have gotten time together. As we head towards Easter I am looking ahead to future work, cleaning the house, putting away the winter clothes, and making much overdo appointments for hair cuts, optometrists, dentists etc. I’m sure you are familiar with that need for an overhaul spring cleaning. Speaking of spring, I have realized that I am not fully adjusted the spring seasons here in upstate NY. The air is humid and smells like the earth and the nearby rivers, the birds sing in the masses, moss begins to grow on the trees and we turn the heater off or down in the house and open the windows. As a light sleeper I’ve always struggled with the transition to spring/summer. As much as I love my vitamin C and sunshine I feel like a vampire when it’s 5am and the sun is rising. The change in seasons still surprise me; they feel like magic as overnight the snow covered hills become green and bloom. It’s amazing to me what the sunshine will do to your energy level as well. I feel the need to get out, exercise, explore, travel, kayak etc. The lethargy of winter is over. It feels like these seasonal changes happen overnight but I know they don’t. Just like in our lives change is constant even if it is subtle. All it takes is looking back a month, half a year, a year to see we are not where we were before. As much as I still struggle to find my place here, to get connected, find a network, make connections and friends I remind myself that a year ago I was struggling to find work. Now I have finally gotten a foot in the door in my career here, I’ve started establishing myself as and editor, I have found a few friends, gotten involved in a small group, and gotten involved in our church’s Easter production. When you are looking ahead and seeing where you want to be it’s often difficult to remember that last month there was snow on the ground. Progress sometimes seems slow looking ahead but always moves faster than we think looking backwards. I’ve already been in NY for a year and a half but I’ve only been in NY for a year and a half. I suppose it’s all about perspective. So there you have it an update and some reflections all rolled into one. What does this spring remind you of? What changes and transitions are you seeing in your life? 1. Soak the oats in milk for an hour and preheat the oven to 400 degrees. 4. After the hour, combine the soaked oat mixture with the applesauce, milk, and egg whites, and shredded carrots and mix until combined. 5. In a separate bowl, whisk dry ingredients together. 8. 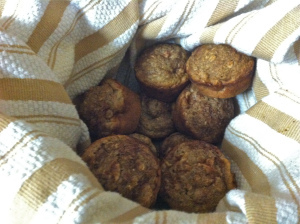 Combine a little cinnamon and sugar (or brown sugar) and top each muffin with a small sprinkling of the mixture. 9. Bake for 20-25 minutes or until done; muffins are done if a toothpick comes out clean the tops of the muffins should be a little firm. These muffins are great for breakfast and can be frozen and reheated in the microwave for a quick breakfast. 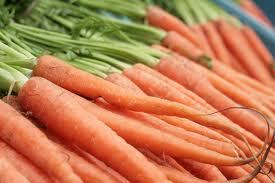 Do you like carrot cake? What is your favorite seasonal spring treat?